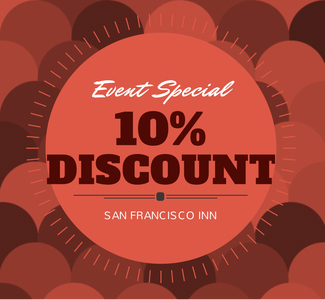 If you are attending an event in the Bay Area, such as business trip, concert, launching, fund raising etc, sign up today and avail a 10% discount on your room rates! IMPORTANT: This special offer is only valid if booking through our website www.sanfranciscoinn.com, a walk-in guest or if booking over the phone. This discount is not valid if booking on Fridays and Saturdays. The promo does not apply on blackout dates. To know more about our blackout dates, please call us at +1 (415) 431-5131.